As of 8:45 a.m. Wednesday, the Flint River at Bainbridge measured 26.93 feet, according to the U.S. Geological Service. Water was flowing at 45,600 cubic feet per second, which is very fast. 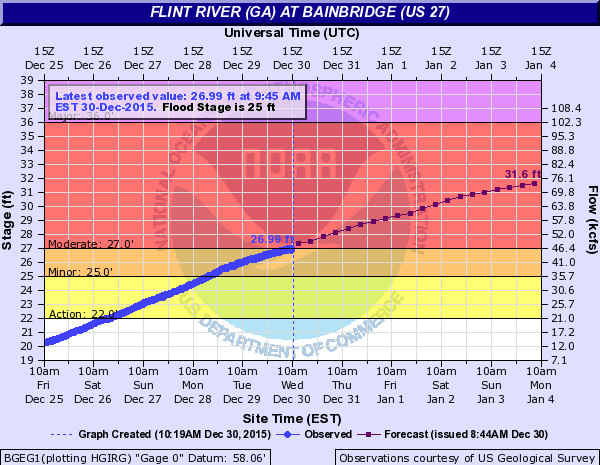 The current forecast is for the Flint River at Bainbridge to crest at 33.1 feet by early Saturday. * At 9:45 AM Wednesday the stage was 27.0 feet. * Forecast: The river will continue rising to near 33.1 feet by Monday early afternoon then begin falling.